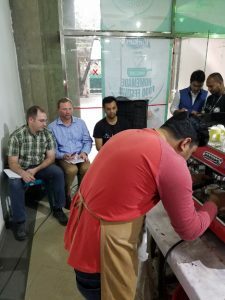 We were excited to sponsor the first-ever barista competition in Bangladesh, in partnership with Sanremo Coffee Machines and 3S. 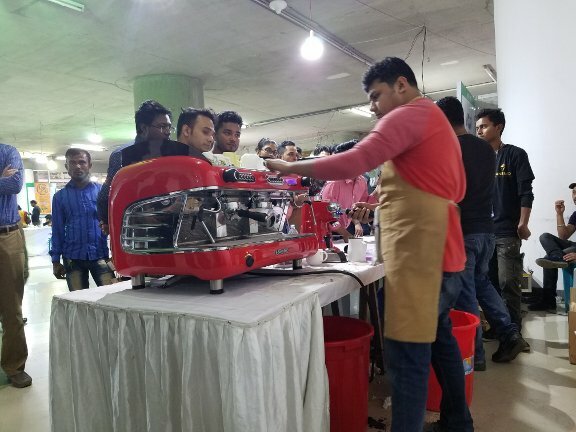 Vying for a grand prize of 50,000 Bangladeshi taka (about $600), 16 local baristas displayed their skills in espresso preparation and latte art. Shurov Islam of Trouville Café took home grand-prize honors, while his colleague Debobrata Bakshi won the second-place prize of a trip to Bangkok and training at the Sanremo offices there. In 2015, Crimson Cup opened the first Crimson Cup Coffee House in Bangladesh as a franchise in partnership with Managing Directors Mohaimin Mostafa and Rehanur Rahman; Managing Partners Tareq Rafi Bhuiyan and his wife, Ayesha Rawshan Bhuiyan; and Investors Sarfaraz Anwar Upol, his wife, Shahana Mirza Asha, and her brothers Mirza Abdul Khaled and Mirza Abdul Khales. Several of the partners absorbed American coffee culture while studying in campus coffee houses as foreign exchange students in the U.S. 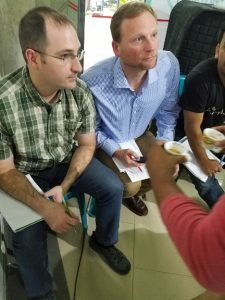 Returning to Bangladesh, they saw an opportunity to capitalize on the growing popularity of American-style coffee in their predominantly tea-drinking country. Today, Crimson Cup BD operates four coffeehouses in the capital city of Dhaka, including three full-services locations in the Banani, Danmondi and Uttara neighborhoods as well as a coffee kiosk in the Banglalink telecommunications offices at Tiger’s Den, 3 Bir Uttam Mir Shawkat Sarak. Competition judge Steve Bayless, a 7 Steps Trainer for Crimson Cup, has trained the baristas at all Crimson Cup BD locations. “I’m pleased to see the baristas continue to prepare great espressos, lattes and other coffee drinks to SCA standards,” he said. Congrats to all the competitors and winners! We hope to make the Bangladeshi Barista Competition an annual event and look forward to seeing how your skills increase each year.